"LSAT" redirects here. For other uses, see LSAT (disambiguation). Reading comprehension, analytical reasoning, logical reasoning, and (unscored) writing. Admissions to Juris Doctor (JD) programs of law schools in the United States, Canada, and some other countries. 35 minutes for each of the 6 sections, for a total of 3 hours and 30 minutes (excluding breaks). 120 to 180, in 1 point increments. Scores of up to 12 tests taken since June 1, 2008 are valid. In 2018, 5 times: February, June, July, September, and November. No official prerequisite. Intended for bachelor's degree graduates and undergraduate students about to graduate, who want to apply to law schools. Fluency in English assumed. 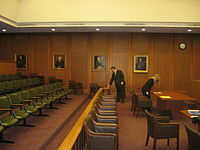 Law schools in United States, Canada, Australia and some other countries. (includes data only for countries where count >= 50). The Law School Admission Test (LSAT) is a half-day standardized test administered six times each year at designated testing centers throughout the world. The Law School Admission Council (LSAC) administers the LSAT for prospective law school candidates. It is designed to assess reading comprehension as well as logical and verbal reasoning proficiency. The test is an integral part of the law school admission process in the United States, Canada (common law programs only), the University of Melbourne, Australia, and a growing number of other countries. The test had existed in some form since 1948, when it was created to give law schools a standardized way to assess applicants in addition to their GPA. The current form of the exam has been used since 1991. The exam has six total sections that include four scored multiple choice sections, an unscored experimental section, and an unscored writing section. Raw scores are converted to a scaled score with a high of 180, a low of 120, and a median score around 150. When an applicant applies to a law school all scores from the past five years are reported and the highest score is used. The purpose of the LSAT is to aid in predicting student success in law school. Researchers Balin, Fine, and Guinier performed research on the LSAT's ability to predict law school grades at the University of Pennsylvania. They found that the LSAT could explain about 14% of the variance in first year grades and about 15% of the variance in second year grades. The LSAT was the result of a 1945 inquiry of Frank Bowles, a Columbia Law School admissions director, about a more satisfactory admissions test that could be used for admissions than the one that was in use in 1945. The goal was to find a test that would correlate with first year grades rather than bar passage rates. This led to an invitation of representatives from Harvard Law School and Yale Law School who ultimately accepted the invitation and began to draft the first administration of the LSAT exam. NYU, in correspondence by memorandum, was openly unconvinced "about the usefulness of an aptitude test as a method of selecting law school students," but was open to experimenting with the idea, as were other schools that were unconvinced. At a meeting on November 10, 1947, with representatives of law schools extending beyond the original Columbia, Harvard, and Yale representatives, the design of the LSAT was discussed. At this meeting the issue of a way to test students who came from excessively "technical" backgrounds that were deficient in the study of history and literature was discussed but ultimately rejected. The first administration of the LSAT followed and occurred in 1948. The LSAC previously administered the LSAT four times per year: June, September/ October, December and February. However, in June 2017, it was announced that the LSAC would be increasing the number of tests from four to six, and would instead be administering it in January, March, June, July, September, and November. 129,925 LSATs were administered in the 2011–12 testing year (June 2011–February 2012), the largest percentage decline in LSATs administered in more than 10 years, and a drop of more than 16% from the previous year, when 155,050 LSATs were administered. The number of LSATs administered fell more than 25% over a two-year period (from the 2009–10 testing year to the 2011–12 testing year). The October 2012 administration reflected a 16.4% drop in volume from its 2011 counterpart. LSAT numbers continued to drop over the next two cycles but to a lesser degree, with 13.4% and 6.2% drops, respectively, for the 2012–13 and 2013–14 cycles. February 2014 showed the first increase in test takers (1.1%) since June 2010. In December of 2018, LSAC announced that the Microsoft Surface Go tablet will be used exclusively to administer the LSAT beginning in 2019 when the test transitions to a digital only format The writing sample section will be separate from the LSAT starting with the June 3, 2019 test administration. By registering for the June or July LSAT, candidates will be automatically eligible to complete the writing section as of the date of the LSAT and up to one year thereafter. The LSAT consists of five 35-minute multiple choice sections (one of which is an unscored experimental section) followed by an unscored writing sample section. Modern tests have 99–102 scored items in total. Several different test forms are used within an administration, each presenting the multiple choice sections in different orders, which is intended to make it difficult to cheat or to guess which is the experimental section. The LSAT contains two logical reasoning ("LR") sections, commonly known as "arguments", designed to test the taker's ability to dissect and analyze arguments. LR sections each contain 24–26 questions. Each question begins with a short argument or set of facts. This is followed by a prompt asking the test taker to find the argument's assumption, to select an alternate conclusion to the argument, to identify errors or logical omissions in the argument, to find another argument with parallel reasoning, or to choose a statement that would weaken/strengthen the argument. The LSAT contains one reading comprehension ("RC") section consisting of four passages of 400–500 words, and 5–8 questions relating to each passage. Complete sections contain 26–28 questions. Though no real rules govern the content of this section, the passages generally relate to law, arts and humanities, physical sciences, or social sciences. The questions usually ask the examinee to determine the author's main idea, find specific information in the passage, draw inferences from the text, and/or describe the structure of the passage. In June 2007, one of the four passages was replaced with a "comparative reading" question. Comparative reading presents two shorter passages with differing perspectives on a topic. Parallels exist between the comparative reading question, the SAT's critical reading section, and the science section of the ACT. This section is regarded as being the hardest to improve in. The current LSAT contains one logic games (LG) section, officially referred to as the "analytical reasoning" section. One section contains four "games" falling into a number of categories including grouping, matching, and ordering of elements. Each LG section has 22–24 questions. Each game begins by outlining the premise ("there are five people who might attend this afternoon's meeting") and establishing a set of conditions governing the relationships among the subjects ("if Amy is present, then Bob is not present; if Cathy is present, then Dan is present..."). The examinee is then asked to draw conclusions from the statements ("What is the maximum number of people who could be present?"). What makes the games challenging is that the rules do not produce a single "correct" set of relationships among all elements of the game; rather, the examinee is tested on their ability to analyze the range of possibilities embedded in a set of rules. Individual questions often add rules or modify existing rules, requiring quick reorganization of known information. The LG section is commonly regarded by LSAT takers as the most difficult section of the test, at least at first, but it is also the section that can be most improved upon with practice. The current test contains one experimental section which Law Services refers to as the "Variable section". It is used to test new questions for future exams. The performance of the examinee on this section is not reported as part of the final score. The examinee is not told which section of the exam is experimental, since doing so could skew the data. Previously, this section has always been one of the first three sections of any given test, but beginning with the administration of the October 2011 LSAT the experimental can be after the first three sections. LSAC makes no specific claim as to which section(s) it has appeared as in the past, and what section(s) it may appear as in the future. This section is regarded as harder than the scored sections. The writing sample appears as the final section of the exam. The writing sample is presented in the form of a decision prompt, which provides the examinee with a problem and two criteria for making a decision. The examinee must then write an essay arguing for one of the two options over the other. The decision prompt generally does not involve a controversial subject, but rather something mundane about which the examinee likely has no strong bias. While there is no "right" or "wrong" answer to the writing prompt, it is important that the examinee argues for his/her chosen position and also argues against the counter-position. LSAC does not score the writing sample. Instead, the essay is digitally imaged and sent to admission offices along with the LSAT score. Between the quality of the handwriting and of the digital image, some admissions officers regard the readability and usefulness of the writing sample to be marginal. Additionally, most schools require that applicants submit a "personal statement" of some kind. These factors sometimes result in admission boards disregarding the writing sample. However, only 6.8% of 157 schools surveyed by LSAC in 2006 indicated that they "never" use the writing sample when evaluating an application. In contrast, 9.9% of the schools reported that they "always" use the sample; 25.3% reported that they "frequently" use the sample; 32.7% responded "occasionally"; and 25.3% reported "seldom" using the sample. LSAC recommends advance preparation for the LSAT, due to the importance of the LSAT in law school admissions and because scores on the exam typically correspond to preparation time. The structure of the LSAT and the types of questions asked are generally consistent from year to year, which allows students to practice on question types that show up frequently in examinations. LSAC suggests, at a minimum, that students review official practice tests, called PrepTests, before test day to familiarize themselves with the types of questions that appear on the exams. LSAC offers one free test that can be downloaded from their website. For best results, LSAC suggests taking practice tests under actual time constraints and representative conditions in order to identify problem areas to focus on in further review. For preparation purposes, only tests after June 1991 are considered modern, since the LSAT was significantly modified after this date. Each released exam is commonly referred to as a PrepTest. The June 1991 LSAT was numbered as PrepTest 1, and the December 2013 LSAT was PrepTest 71. Certain PrepTests are no longer published by LSAC (among them 1–6, 8, 17, 39, and 40), despite the fact that they were in print at one time. However, these tests have been made available through some of the test preparation companies, which have licensed them from LSAC to provide only to students in their courses. For a few years, some prep companies sold digital copies of LSAT PrepTests as PDFs, but LSAC revised its licensing policy in 2016, effectively banning the sale of LSAT PDFs to the general public. Some students taking the LSAT use a test preparation company. Students who do not use these courses often rely on material from LSAT preparation books, previously administered exams, and internet resources such as blogs, forums, and mobile apps. The LSAT is a standardized test in that LSAC adjusts raw scores to fit an expected norm to overcome the likelihood that some administrations may be more difficult than others. Normalized scores are distributed on a scale with a low of 120 to a high of 180. The LSAT system of scoring is predetermined and does not reflect test takers' percentile. The relationship between raw questions answered correctly (the "raw score") and scaled score is determined before the test is administered, through a process called equating. This means that the conversion standard is set beforehand, and the distribution of percentiles can vary during the scoring of any particular LSAT. Adjusted scores lie in a bell curve, tapering off at the extremes and concentrating near the median. For example, there might be a 3–5 question difference between a score of 175 and a score of 180, but the difference between a 155 from a 160 could be 9 or more questions--this is because the LSAT uses an ordinal grading system. Although the exact percentile of a given score will vary slightly between examinations, there tends to be little variance. The 50th percentile is typically a score of about 151; the 90th percentile is around 165 and the 99th is about 173. A 178 or better usually places the examinee in the 99.9th percentile. Examinees have the option of canceling their scores within six calendar days after the exam, before they get their scores. LSAC still reports to law schools that the student registered for and took the exam, but releases no score. Test takers typically receive their scores by e-mail between three and four weeks after the exam. There is a formal appeals process for examinee complaints, which has been used for proctor misconduct, peer misconduct, and occasionally for challenging a question. In very rare instances, specific questions have been omitted from final scoring. The LSAT is considered an important part of the law school admissions process, along with GPA. Many law schools are selective in their decisions to admit students, and the LSAT is one method of differentiating candidates. Additionally the LSAC says the LSAT (like the SAT and ACT at the undergraduate level) serves as a standardized measure of one's ability to succeed during law school. Undergraduate grade points can vary significantly due to choices in course load as well as grade inflation, which may be pervasive at an applicant's undergraduate institution, but almost nonexistent at that of another. Some law schools, such as Georgetown University and the University Of Michigan have added programs designed to waive the LSAT for selected students who have maintained a 3.8 undergraduate GPA at their schools. LSAC says its own research supports the use of the LSAT as a major factor in admissions, saying the median validity for LSAT alone is .41 (2001) and .40 (2002) in regard to the first year of law school. The correlation varies from school to school, and LSAC says that test scores are more strongly correlated to first year law school performance than is undergraduate GPA. LSAC says that a more strongly correlated single-factor measure does not currently exist, that GPA is difficult to use because it is influenced by the school and the courses taken by the student, and that the LSAT can serve as a yardstick of student ability because it is statistically normed. However, the American Bar Association has waived the requirement for law schools to use the LSAT as an admission requirement in select cases. This may be due to the fact that an emphasis on LSAT scores is considered by some to be detrimental to the promotion of diversity among applicants. Others argue that it is an attempt by law schools to counteract declining enrollment. Most admission boards use an admission index, which is a formula that applies different weight to the LSAT and undergraduate GPA and adds the results. This composite statistic can have a stronger correlation to first year performance than either GPA or LSAT score alone, depending on the weighting used. The amount of weight assigned to LSAT score versus undergraduate GPA varies from school to school, as almost all law programs employ a different admission index formula. Students may take the test as many times as they wish. Prior to 2017, only three attempts were allowed in a two-year period. Every score within five years is reported to law schools during the application process, as well a separate average of all scores on record. When faced with multiple scores from repeat test takers, users of standardized assessments typically employ three indices—most recent, highest, and average scores—in order to summarize an individual’s related performance. How the law schools report the LSAT scores of their matriculants to the American Bar Association (ABA) has changed over the years. In June 2006, the ABA revised a rule that mandated law schools to report their matriculants' average score if more than one test was taken. The current ABA rule now requires law schools to report only the highest LSAT score for matriculants who took the test more than once. In response, many law schools began considering only the highest LSAT score during the admissions process, as the highest score is an important factor in law school rankings such as those published by US News and World Report. Many students rely heavily upon the rankings when deciding where to attend law school. Starting October 1973, those taking the LSAT were required to have fingerprints taken, after some examinees were found to have hired impostors to take the test on their behalf. A recent controversy surrounding the LSAT was the requirement that examinees submit to fingerprinting on the day of testing. Although LSAC does not store digital representations of fingerprints, there is a concern that fingerprints might be accessible by the U.S. Department of Homeland Security. At the behest of the Privacy Commissioner of Canada, the LSAC implemented a change as of September 2007 which exempts Canadian test takers from the requirement to provide a fingerprint and instead requires that Canadian test-takers provide a photograph. Starting with the June 2011 admission of the LSAT, LSAC expanded this policy to include test-takers in the United States and Caribbean; LSAC therefore no longer requires fingerprints from any test takers, and instead requires that they submit a photograph. ^ a b c "About the LSAT". www.lsac.org. Archived from the original on 2 March 2018. Retrieved 30 April 2018. ^ "LSAT Dates and Deadlines". www.lsac.org. Archived from the original on 30 September 2017. Retrieved 30 April 2018. ^ "LSATs Administered". lsac.org. Archived from the original on 7 April 2018. Retrieved 30 April 2018. ^ "LSAT and Credential Assembly Service (CAS) Fees". www.lsac.org. Archived from the original on 9 January 2018. Retrieved 9 May 2018. ^ "Fee Waivers for the LSAT and Credential Assembly Service (CAS)". www.lsac.org. Archived from the original on 20 March 2017. Retrieved 30 April 2018. ^ LSAC. "The Law School Admission Council (LSAC)". www.lsac.org. Archived from the original on 14 April 2018. Retrieved 30 April 2018. ^ "About the Law School Admission Council". Lsat.com. Archived from the original on 10 February 2012. Retrieved 2013-07-22. ^ "Apply to study the JD in Australia". Lsac.org. Archived from the original on 2 August 2013. Retrieved 22 July 2013. ^ "About the LSAT". Law.unimelb.edu.au. 2012-10-25. Archived from the original on 31 July 2013. Retrieved 2013-07-22. ^ Brunet Marks, Alexia; Moss, Scott A. (2016-06-01). "What Predicts Law Student Success? A Longitudinal Study Correlating Law Student Applicant Data and Law School Outcomes". Journal of Empirical Legal Studies. 13 (2): 205–265. doi:10.1111/jels.12114. ISSN 1740-1461. ^ "Frontline: Secrets of the SAT: Lani Guinier Interview". Secrets of the SAT. Frontline. Archived from the original on 13 February 2015. Retrieved 13 February 2015. ^ "History" (PDF). Archived from the original (PDF) on 9 February 2014. Retrieved 14 May 2014. ^ Segal, David (19 March 2012). "For 2nd Year, a Sharp Drop in Law School Entrance Tests". The New York Times. Archived from the original on 19 December 2013. Retrieved 28 October 2013. ^ "LSATs Administered". Lsac.org. Archived from the original on 31 March 2014. Retrieved 31 March 2014. ^ Margolis, Wendy (December 10, 2018). "LSAC Announces Technology Collaboration with Microsoft". LSAC. Retrieved December 14, 2018. ^ "LSAC Announces Technology Collaboration with Microsoft | The Law School Admission Council". www.lsac.org. Retrieved 2018-12-15. ^ "JD - The LSAT - Logical Reasoning Questions". LSAC. Archived from the original on 13 July 2013. Retrieved 22 July 2013. ^ "Reading Comprehension Questions". Lsac.org. Archived from the original on 9 July 2013. Retrieved 22 July 2013. ^ "LSAC Redirect Page". Lsac.org. Archived from the original on 11 May 2013. Retrieved 22 July 2013. ^ a b "Preparing for the LSAT". LSAC. Archived from the original on 10 September 2013. Retrieved 22 July 2013. ^ "LSAT Prep Materials". Lsac.org. Archived from the original on 26 July 2013. Retrieved 22 July 2013. ^ "The Official LSAT PrepTests". LSAC. Retrieved 2013-12-21. ^ "LSAT Content Licensing". LSAC. Archived from the original on 14 February 2017. Retrieved 13 February 2017. ^ "Test Preparation Market in the US 2016-2020". Research and Markets. Archived from the original on 14 February 2017. Retrieved 13 February 2017. ^ "A History of the Law School Admission Council and the LSAT" (PDF). Archived from the original (PDF) on 25 August 2013. Retrieved 22 July 2013. ^ "About your LSAT Score". Lsac.org. Archived from the original on 25 July 2013. Retrieved 22 July 2013. ^ "LSAT Score Release Dates". Lsac.org. Archived from the original on 24 July 2013. Retrieved 22 July 2013. ^ Nieswiadomy, Michael (2009-06-25). "LSAT Scores of Economics Majors: The 2008-2009 Class Update by Michael Nieswiadomy :: SSRN". Papers.ssrn.com. SSRN 1430654. ^ Slater, Dan (25 September 2008). "Skip the LSAT, Head Straight to Law School!". Blogs.wsj.com. Archived from the original on 13 May 2013. Retrieved 22 July 2013. ^ Jaschik, Scott (14 January 2011). "ABA May Drop LSAT Requirement". Insidehighered.com. Archived from the original on 29 October 2013. Retrieved 22 July 2013. ^ "Should Law Schools Drop the LSAT Requirement?". huffingtonpost.com. 10 March 2015. Archived from the original on 7 February 2017. Retrieved 6 February 2017. ^ "Limitations on Test Taking". Law School Admission Council. Archived from the original on 21 December 2013. Retrieved 20 December 2013. ^ Sweeney, Andrea Thorton; Marcus, Laura A.; Reese, Lynda M. (2 October 2010). "The Validity of Law School Admission Test Scores for Repeat Test Takers: 2005 Through 2008 Entering Law School Classes" (PDF). The Law School Admission Council. lsac.org. p. 1. Archived from the original (PDF) on 10 May 2017. Retrieved 2016-03-02. ^ "Methodology: Best Law Schools Rankings - US News and World Report". Usnews.com. 11 March 2013. Archived from the original on 6 April 2010. Retrieved 28 October 2013. ^ "Law Students Rank Their Future - US News and World Report". Usnews.com. 7 January 2011. Archived from the original on 15 February 2017. Retrieved 14 February 2017. ^ Frum, David (2000). How We Got Here: The '70s. New York, New York: Basic Books. pp. 61–62. ISBN 978-0-465-04195-4. ^ "Canadian Lawyer Home". Canadianlawyermag.com. 21 October 2013. Archived from the original on 5 February 2008. Retrieved 28 October 2013. ^ "LSAT Admission Ticket Photo Requirement". LSAC.org. 31 March 2011. Archived from the original on 26 March 2014. Retrieved 4 April 2014. This page was last edited on 30 March 2019, at 17:33 (UTC).